What is GROUNDED & GLOWING The Program? Have you ever gone through a tough season in life? If you are reading this, I’m going to venture out and say that you have (in fact… I am even going to venture to say that 100% of you (myself included) have gone through a difficult season). Here’s my point……. There is a rhyme and a reason for EVERYTHING in life. The hilltops and the valleys. The victory and the sorrow. The trials and the tribulations…… you get it? It is my heart’s greatest desire to share one of (if not the) most difficult season of my life with you in an educational, professional, enlightening, empowering, and motivating manner. With that being said, please allow me to introduce to you our signature (and life changing program), Grounded and Glowing. Together, let’s go over a few of the most frequent questions I have been receiving in regards to our program and launch! Grounded + Glowing (G+G for short!) is our Self-Paced Program designed to get you UNSTUCK in Motherhood. Over the course of the program, you’ll learn how to heal your past and gorgeously transform your future. It is time to AWAKEN the woman within, sister. Why did I create G+G? I have three short answers for you in creating G + G. First, it came from my silent battle with stress, anxiety, and chronic panic. Second, it came from the request and struggles from many of our clients, fans, and followers. Lastly, (and most importantly), it came from an immense desire I felt God lay on my heart. How does this program relate to the struggles women face today? Great question! Here is my simple(ish) response. In today’s society, there is an increase in maternal isolation, perfectionist pressure, mommy comparison, lack of balance, inadequacy, GUILT, and complete exhaustion. Momma, is this something you notice yourself falling victim to? If so, I want to dive a little deeper….. Do any of these qualities (listed below!) sound like you? BE HONEST! You are a BUSY Mom and you cannot find a single minute for yourself. You’ve lost yourself in the midst of motherhood. You are a talented and gifted woman but you consistently put your needs and desires on the back burner. You have so many roles and commitments to fill each day that you are constantly over scheduled, overbooked, and struggling with time management. You are a wife. A mother. A daughter. A friend. A woman hungry for Christ’s love and will for your life. You neglect taking care of yourself because you’re too busy taking care of everyone else. Your cup is ALWAYS on low. You’re never really PRESENT with your children, friends, spouse, or self. You’re not confident in your ability to make the right choices for yourself or children. You’re easily frustrated, stressed, and become UNGLUED on the regular. You’re tired of yo-yo living, dieting, unhappiness, poor sleep, and chronic anxiety and depression. Sound a little familiar? If so, sister friend… you are NOT alone. Discover More on G+G HERE! I’ve been there. In fact, I let myself GO, SO FAR, that I was in and out of hospitals, doctor offices, and seeing multiple specialists because of my poor lifestyle habits. I was running on empty. Racing through life. Neglecting quality nutrition. Neglecting exercise to honor (but rather abuse) my body. Neglecting “me time” and self-care. Neglecting stillness. Neglecting intimate time with God. Sweet girl, I was on the hamster wheel of society. I fell for it. The pressures. The stress. The comparison. The game. To my expense, it cost me my health, friendships, relationships, and sanity. By God’s grace, I am here today to tell you that it is POSSIBLE to overcome. To release old habits. To move through trials. To overcome and master simple, beautiful, refreshing, and GLOWING lifestyle practices. And that, my friends is why I created Grounded + Glowing. What is the goal and flow of G + G? Grounded and Glowing is a self-paced, interactive program that helps women get UNSTUCK in motherhood.The Online Program teaches women how to break free from past habits and fully awaken to the woman God has called her to be using the signature Blossom Formula. Inside our International G+G Program, we service women who are overwhelmed, rundown, exhausted, and depleted of joy, purpose, and passion for motherhood (and life). We take each client down a nourishing path, gently ridding past patterns of what’s no longer working with our breakthrough lessons centered on balance, clarity, purpose, and, of course, health and wellness. Blossom To Be Fit’s Grounded + Glowing Curriculum gently reboots the lifestyle of each woman enrolled in our program from the inside, out. Inside the program, you’ll learn how to heal relationships, eating habits, negative self-talk and insecurities, and feelings of jealousy, anger, and bitterness. You’ll be shown how to establish a strong sense of time management, radical self-care, life purpose in God’s will for your life, the ability to create space to focus on your heart’s greatest desires, and to find passion in motherhood. 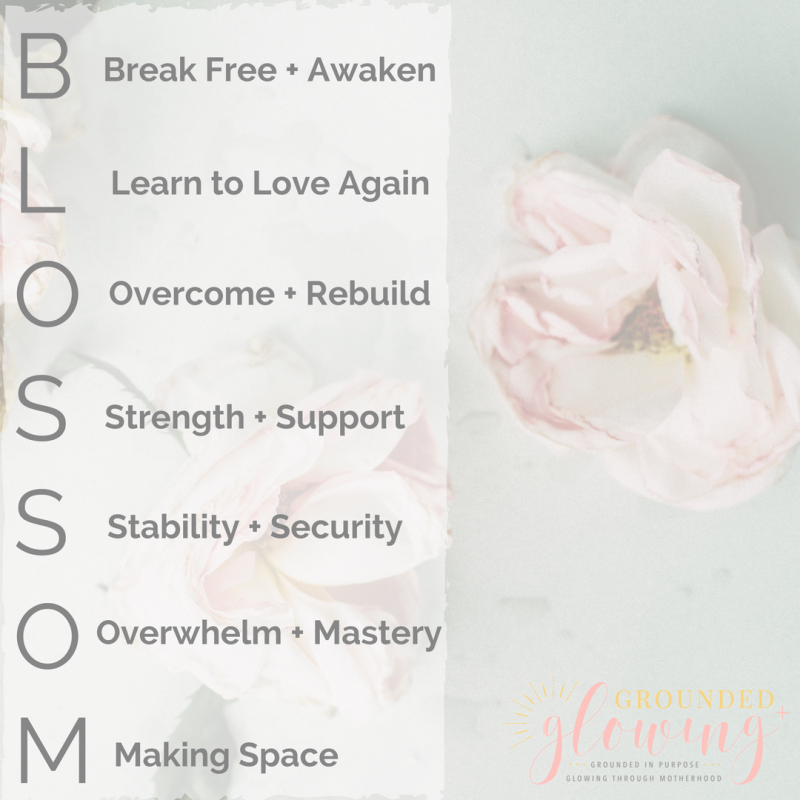 Here, at Grounded + Glowing, I teach you my EXACT blueprint using the Blossom Formula for getting UNSTUCK in motherhood as you learn to get grounded in God’s purpose and glowing with absolute gratitude and self-awareness. As you go through the program at your own pace, on your own time, you’ll learn how to make wise and Godly choices for your health and for your family. You’ll be in-tune with your calmness, energy, and peace. You’ll learn how to prioritize, rid loneliness, develop a tribe of loving and supportive women to do life with, and you will completely heal your life by creating space for mind, body, and soul transformation. Through Grounded + Glowing, I teach each and every woman how to heal relationships, eating habits, negative self-talk, insecurities, feelings of jealousy, anger, bitterness, and much, much more. Together, bonded with women all over the world, you will learn how to master these beautiful skills while tuning into God’s will for your life. It’s time for YOU to create space for your gorgeous transformation. Tune into your heart’s greatest desires and passions. It’s time for us to get BUSY, girlfriend! We look forward to guiding, educating, encouraging, and loving you, Momma! When Should Your Child Be Feeding Him/Herself?